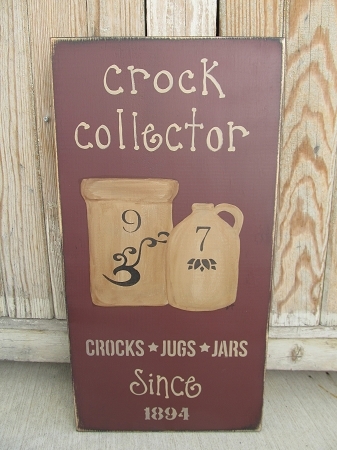 Primitive Crock Collector Vertical Hand Made Sign. 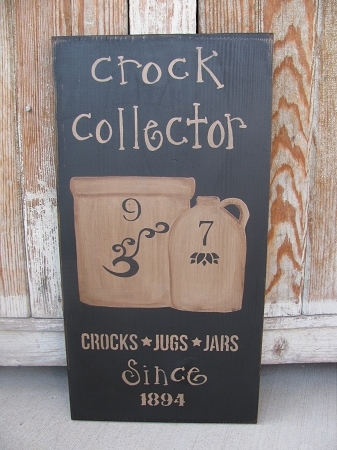 I've painted on a crock and a jug, and hand painted the words Crock Collector above, crocks jugs and jars below along with since 1894. The background of this sign is burgundy. Other colors available Then the crocks are all painted in khaki tan with black lettering and decals. I antiqued all of the stoneware pieces to show shading and depth. It's an attractive sign with a primitive look. Size is 22" x 12" x 1" thick pine wood board. Hanging options available. Hand made by Heidi.